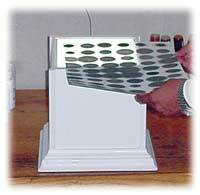 The blotter spot test is a two-step process, namely sample preparation and sample analysis. In both cases, consistency must be maintained to ensure that data from each sample can be compared. Shake sample vigorously by hand for one minute. Draw oil sample with a sampler. Place one drop of oil on the mark of chromatographic paper. Deposit excess oil from the sampler into the waste oil container. Clean the oil sampler tube with paper. Let chromatogram develop for six hours (soot and glycol). 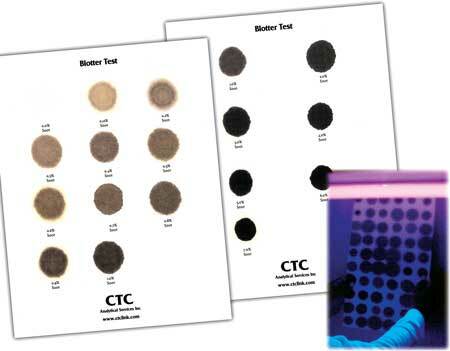 Inspect blotter for soot and glycol. Compare chromatograms with standard comparator. Record results in data sheet. Let chromatogram develop an additional 18 hours (for a total of 24 hours) before analyzing for fuel dilution. Inspect chromatogram with UV light for fuel dilution. Compare chromatogram with standard comparator. Send oil sample to laboratory for exception testing if necessary. After six hours of developing, the chromatogram is placed on a box light and examined for soot and coolant (glycol) (Figure 1). The white light provides uniform light, which is important during interpretation. It also reduces variability in intensity and color. The technician compares the chromatogram with the respective standard and reports the condition in the data sheet. Excessive soot contamination or extended drain intervals cause the dispersant additives to deplete and the soot particles to agglomerate, forming larger particles. Once this occurs, the oil’s viscosity increases. When the oil drop is deposited on the chromatographic paper, the larger particles will not travel with the base oil and will form a black spot from the point of deposition. If the additives are doing their job, soot particles will be small and finely suspended in the lubricant. When the oil drop is deposited on the chromatographic paper, soot particles will travel easily and the chromatogram will show a translucent gray color (Figure 2). Detecting glycol using the blotter spot test can be difficult because of the coolant’s effects on a lubricant’s dispersancy. Coolant contamination forms acids in crankcase oil affecting soot dispersancy, even at low soot loading. Glycol contamination can also form destructive “oil balls” and additive precipitation when thermally aged in crankcase lubricants. When a drop of lubricant contaminated with glycol is placed on the chromatographic paper, the soot particles can be agglomerated due to dispersant depletion and will not travel. A dark or brownish stain in the center of the spot could be due to disrupted dispersancy and soot coagulation, a common consequence of glycol contamination. A black sticky paste with a well-defined (sharp edge) periphery is cause for serious concern. 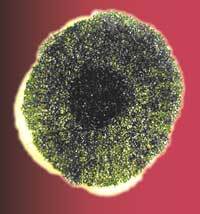 When glycol is present, a soot ring often develops around a yellow/brown center (Figure 3). After 24 hours of development, the chromatogram is placed under a UV light in a dark room (Figure 4). Inspecting the chromatogram under white or solar light makes it difficult to interpret, however under UV light, fuel dilution will show as fluorescent rings. The light ends of diesel fuel diluted in the lubricant will travel faster than base oil and other contaminants, creating a distinctive translucent zone at the outer ring of the chromatogram. When inspected under UV light, a fluorescent ring will appear. 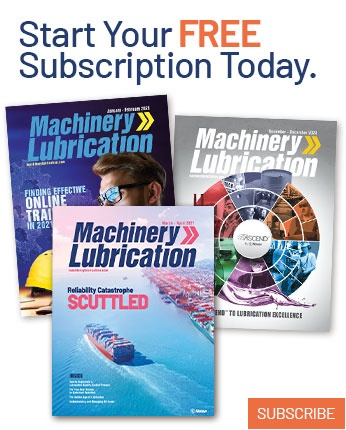 Diesel fuel dilution directly affects additive concentrations, causing premature loss of dispersancy and leading to deposits and filter plugging. Also, if the problem’s source is dribbling injectors, poor injection timing and/or excessive ring clearances, excessive soot levels that affect dispersancy can be produced. The chromatogram’s size and fluorescence will be proportional to the amount of fuel dilution. The presence of well-defined inner rings in the chromatogram is an indicator that at least one cylinder is working out of balance. Doyle, David (2003), Field Screening Methods for Soot Levels in Used Diesel Engine Oils. 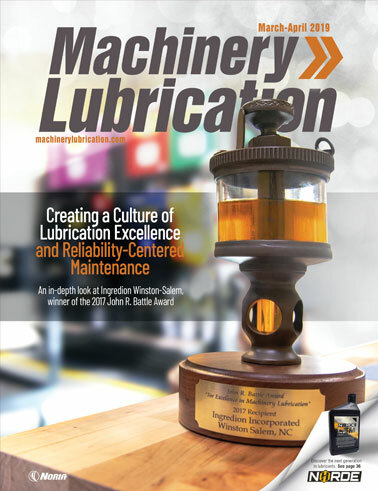 2003 Lubrication Excellence Conference Proceedings.